Winter has come and with the weather comes winter colds, flu, and respiratory infections. Some health problems, such as asthma, sore throat and cold sores, are triggered or worsened by cold weather. A dry, scratchy throat is a common symptom — especially during the cold winter months when the air is dry and upper respiratory infections are spreading. One of the reasons that these illnesses are so prevalent in winter is because they thrive in a low-humidity environment. You’re likely familiar with how drastic a dry-heat is from a humid heat but may not recognize how much a role humidity plays in winter comfort levels as well. Low humidity levels make your home feel colder, dry out your skin and make it easier to spread contagions. These conditions can also damage your home, and by correcting the condition with a whole house humidifier, you can protect your property and your loved ones. You have probably seen the portable humidifiers that plug into the wall and spray a mist into the room. These are able to control at best, one room at a time. They require frequent maintenance as the water can become a bacteria breeding ground. The water needs to be regularly changed and the machine cleaned. A whole house humidifier is installed directly into your ductwork. These systems use the same ductwork that your central heating system uses. This allows the unit to deliver safe and appropriate humidity to the entire home. 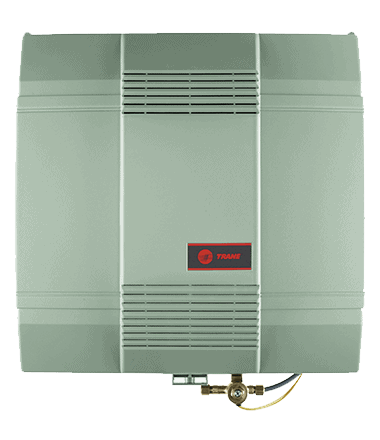 When your furnace cycles and heats the air in your home, that air is also humidified. The maintenance is generally about as complicated as replacing the humidifier pad or filter once per year. If you have a steam unit, it just needs to be cleaned annually. There is also a humidistat that allows you to dial in the preferred level of humidity. Health and Comfort – What else? Humidity also protects hardwood floors and furniture from damage. A dry environment can cause hardwood floors to dry out and crack. A more humid environment can make furniture last longer in the same condition as well. It also allows you to turn down your thermostat, reducing heating costs because a properly humidified home feels warmer than a cold dry one. As a long term investment, it saves you money and is a better way to provide health and comfort to your family versus portable units. The cost of running them should only add a few pennies to your water bill. Give us a call at 817-488-6733 and we’ll be happy to discuss your options if you’re finding yourself with an uncomfortably dry throat this season.